Andy Pye examines the latest in laser technology to emerge from nanofabrication and cleanroom facilities in Finland. 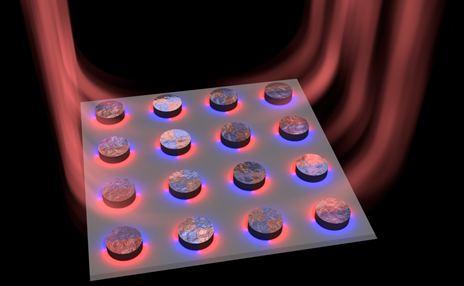 Researchers at Aalto University, Finland claim to be the first to develop a plasmonic nanolaser that operates at visible light frequencies and uses so-called dark lattice modes. The research team used the nanofabrication facilities and cleanrooms of the national OtaNano research infrastructure, which constitute 4700 m2 laboratory space (including a 2600 m2m class 10–1000 cleanroom, Researchers and companies can use the cleanroom, as well as special facilities for testing and developing new devices at cryogenic temperatures. New users are given training in the equipment and process, safe ways of working and working with chemicals. Consultancy is available concerning process flows and equipment preference, small-scale processing, measurement techniques and imaging. Some customers rent the cleanroom space and use their own dedicated equipment. The Aalto laser works at length scales 1000 times smaller than the thickness of a human hair. The lifetimes of light captured in such small dimensions are extremely short. But the potential is for on-chip coherent light sources, such as lasers, that are extremely small and ultrafast. The laser operation in this work is based on silver nanoparticles arranged in a periodic array. In contrast to conventional lasers, where the feedback of the lasing signal is provided by ordinary mirrors, this nanolaser utilises radiative coupling between silver nanoparticles. These 100nm particles act as tiny antennas. To produce high intensity laser light, the interparticle distance was matched with the lasing wavelength so that all particles of the array radiate in unison. Organic fluorescent molecules were used to provide the input energy (the gain) that is needed for lasing. A major challenge in achieving lasing this way was that light may not exist long enough in such small dimensions to be helpful. The researchers found a smart way around this potential problem: they produced lasing in dark modes.